Andrew (Parry Shen) is the only survivor of Victor Crowley’s (Kane Hodder) killing sprees. Crowley has been gone for years and Andrew has turned his ordeal into an income source as well as he can. So when he gets offered money to return to the island, he agrees to do it, despite the anxiety this proposal provokes. But he feels safe in the knowledge that Crowley isn’t there anymore. Only that Crowley has actually been resurrected by accident, and the killing starts all over again. Victor Crowley doesn’t bring anything new to the series, but it’s no better or worse than the previous films. Usually the /slash surprise movies aren’t outright slashers, but something a little more mainstream. And it is a ballsy move to show the fourth part of a series as a surprise film – if I hadn’t seen the first three, I’d have probably been pissed about that. But anyway, as a faithful /slash attendee, of course I have seen the other three films. 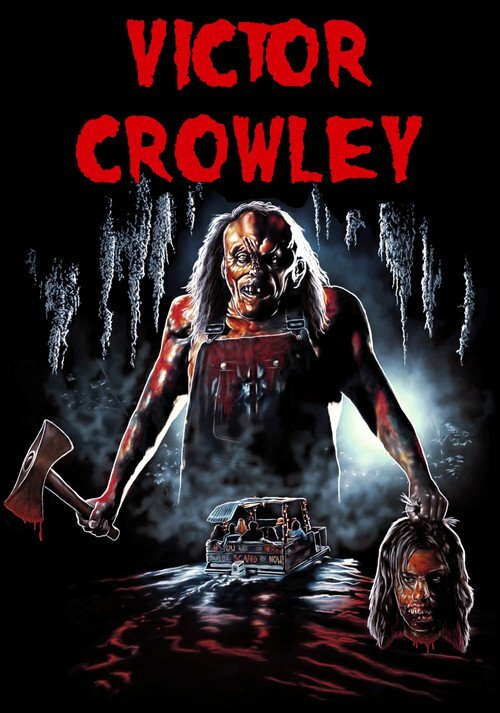 Victor Crowley is entertaining, stupid and not all that great. It is funny at times, but mostly it doesn’t tickle my funny bone. Quite to the contrary actually: there were transphobic jokes, ‘gypsy’ curses and jokes about the evil ex-girlfriend (and how strange is it that the first thing pointed out to her after a plane-crash is that her wig isn’t on correctly anymore?) that were offensive and tired. But really, I don’t have much to say about the film. If you’ve seen the other three in the series, you know what you’re getting. If you liked it before, you’ll probably like it again now. I wasn’t particularly taken with the other films (though I did like the third slightly better than the others), and this one proves no exception. This entry was posted in movies and tagged /slash Filmfestival, 2017, Adam Green, Brian Quinn, Chase Williamson, Dave Sheridan, Felissa Rose, Hatchet, Kane Hodder, Katie Booth, Krystal Joy Brown, Laura Ortiz, Parry Shen, Tiffany Shepis, Victor Crowley by kalafudra. Bookmark the permalink.